Cold water isn't just for bright colors anymore. Today's washing machines and detergents are designed to work with cold water for less energy use. If you have clothes with stubborn stains, set the water temperature to warm instead of hot. It takes as much energy to run a full load as it does to run a half-load. In times of necessity when you have to run a less-than-full load, be sure to set the proper water level. It might seem logical that more laundry detergent equals cleaner clothes. The fact is that excess suds can actually spread dirt rather than remove it, while preventing the mild scrubbing friction that comes from clothes rubbing against each other. Always measure laundry detergent rather than just "eyeballing" it as you might with dish detergent. Try half the manufacturer's recommended amount, and if the clothes aren't clean enough, add small increments until you're satisfied with the results. 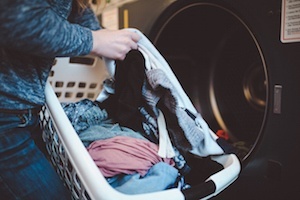 Not only do dryers consume large amounts of energy, they can cause shrinking, stretching and other damage to clothes. Air-drying is gentle, eco-friendly and leaves clothes smelling fresh. Think you don't have enough room to air-dry clothes? There are several cleverly designed racks and hangers that maximize available space in your Springs luxury apartment home. Store-bought laundry detergents, whiteners and fabric softeners can be expensive. It's surprisingly easy and cost-effective to make laundry supplies from bar soap, vinegar, baking soda and other ingredients you may already have on hand. Another advantage of DIY products is that they have much less chemicals than commercial items. This is particularly beneficial if you or family members have sensitive skin or allergies. What do washing machines have in common with cars? Clean ones run better. Every six months or so, run the empty washing machine on a full cycle with vinegar and baking soda. Use a toothbrush to scrub debris from nooks and crannies in the agitator, lid and other parts. Overfull lint traps can reduce the dryer's effectiveness, and they're also a serious fire hazard. Clear the lint after every load and wash the trap in the sink a couple of times a year using dish detergent and a bottle brush. Do you automatically throw clothes in the laundry basket after one wearing? Overwashing can be an unnecessary waste of water and energy, as well as undue stress that shortens the life of your wardrobe. How do you make laundry day a little easier? Share your tips with us in the comments!